Teach violin with the popular Suzuki Violin School. The Suzuki Method of Talent Education is based on Shinichi Suzuki's view that every child is born with ability, and that people are the product of their environment. According to Shinichi Suzuki, a world-renowned violinist and teacher, the greatest joy an adult can know comes from developing a child's potential so he/she can express all that is harmonious and best in human beings. Students are taught using the "mother-tongue" approach. Each series of books for a particular instrument in the Suzuki Method is considered a Suzuki music school, such as the Suzuki Violin School. Suzuki lessons are generally given in a private studio setting with additional group lessons. The student listens to the recordings and works with their Suzuki violin teacher to develop their potential as a musician and as a person. 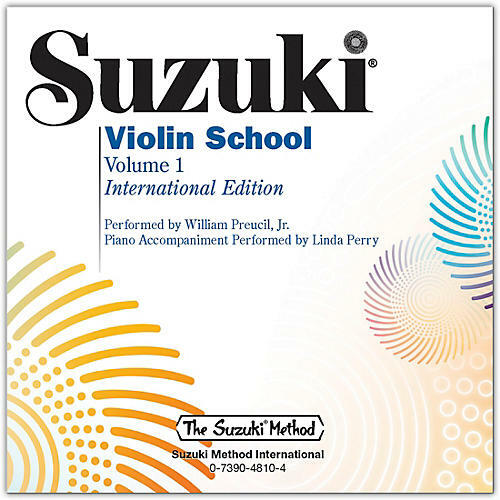 This CD of the Suzuki violin method, Volume 1 features recordings by William Preucil, Jr., accompanied by Linda Perry, as well as piano accompaniments recorded alone. Titles: Twinkle, Twinkle, Little Star Variations (Suzuki) * Lightly Row (Folk Song) * Song of the Wind (Folk Song) * Go Tell Aunt Rhody (Folk Song) * O Come, Little Children (Folk Song) * May Song (Folk Song) * Long, Long Ago (Bayly) * Allegro (Suzuki) * Perpetual Motion (Suzuki) * Allegretto (Suzuki) * Andantino (Suzuki) * Etude (Suzuki) * Minuet 1, Minuett III from Suite in G Minor for Klavier, BWV 822 (Bach) * Minuet 2, Minuet, BWV Anh. II 116 from Notebook for Anna Magdalena Bach (Bach) * Minuet 3, Minuet BWV Anh. II 114/Anh. III 183 (Bach) * The Happy Farmer from Album for the Young, Op. 68, No. 10 (Schumann) * Gavotte (Gossec). This title is available in SmartMusic.